4-PIECE INDIANA GLASS "KINGS CROWN" AMBER SHERBERT-SERVING GLASSES/CLEARANCE! 6-PC INDIANA WHITEHALL CUBE "MULTI-COLOR" 6" TUMBLERS/VINTAGE SET/FREE SHIP! 4-PC INDIANA GLASS "CUBE" AMBER 3 3/4" JUICE GLASSES/FLARED TOP/VINTAGE/SALE! 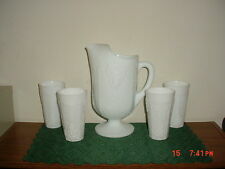 5-PC INDIANA "HARVEST GRAPE" RAISED MILK GLASS PITCHER & 4 TUMBLERS/FREE SHIP! 4-PC INDIANA CLEAR GLASS "PARK LANE" PEDESTAL GOBLETS/VINTAGE/FREE SHIP! 2-PIECE INDIANA "DIAMOND POINT" 6 1/2" PEDESTAL GOBLETS/VINTAGE GLASS/CLEARANCE! INDIANA GLASS "GARLAND" HARVEST GRAPE OVAL 12 1/4" BLUE GLASS BOWL/FREE SHIP! 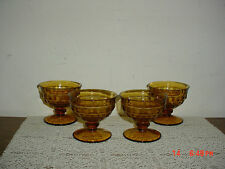 2-PC INDIANA PEDESTAL "AMBER" LRG 6" GLASS GOBLETS/THUMB PRINT/1960's/FREE SHIP! 2-PIECE INDIANA KINGS CROWN "AMBER" COFFEE CUPS/FITS SNACK PLATES/CLEARANCE! 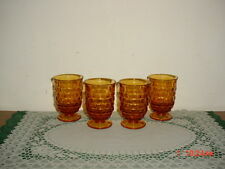 4-PIECE INDIANA "AMBER" CUBE GLASS 3 1/2" PUDDING GLASSES/VINTAGE SET/FREE SHIP! 4-PIECE INDIANA CLEAR GLASS "CUBE" 3 1/2" PUDDING-ICE CREAM GLASSES/CLEARANCE! 4-PC INDIANA GLASS "CUBE" AMBER 6" WATER-DRINKING TUMBLERS/FLARED TOP/FREE SHIP! 4-PIECE INDIANA GLASS "CUBE" 6" WATER-DRINKING GLASSES/FLARED TOP/FREE SHIP! 3-PIECE INDIANA PRESSED GLASS "PARK LANE" 6 1/4" PEDESTAL GOBLETS/CLEARANCE! 4-PC INDIANA GLASS MILK GLASS "SNACK" 2-TRAYS & 2-COFFEE CUPS/VINTAGE/FREE SHIP! 5-PC INDIANA GLASS "PARK LANE" SERVING PITCHER & 4 GOBLETS/VINTAGE/FREE SHIP! 2-PIECE INDIANA WHITEHALL GLASS CUBE "ICE BLUE" 6" DRINKING TUMBLERS/FREE SHIP! 3-PC INDIANA GLASS "KINGS CROWN" MINI GREEN 3 1/2" WINE CORDIALS/FREE SHIP! INDIANA GLASS KINGS CROWN "AMBER" ROUND 10 1/2" SNACK-SERVING TRAY/FREE SHIP! 3-PC INDIANA GLASS "CUBE" AMBER 6" WATER-DRINKING GLASSES/FLARED TOP/FREE SHIP! 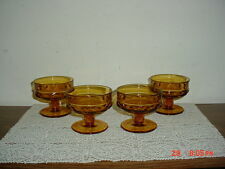 4-PC INDIANA GLASS "KINGS CROWN" AMBER PUDDING GLASSES/VINTAGE/FREE SHIP! 2-PC INDIANA CUBE "ICE BLUE" 6 1/8" WATER TUMBLERS/ORIGINAL/VINTAGE/FREE SHIP! INDIANA GLASS "GARLAND" OVAL 12" BLUE CARNIVAL GLASS FOOTED BOWL/NICE/FREE SHIP! INDIANA GLASS "KINGS CROWN" GREEN 10 1/2" SANDWICH-SNACK TRAY/VINTAGE/FREE SHIP! INDIANA GLASS "DIAMOND POINT" 12 1/2" GLASS SERVING PLATTER/VINTAGE/FREE SHIP! 4-PIECE INDIANA CLEAR GLASS "CUBE" 3 1/2" PUDDING-SERVING GLASSES/FREE SHIP! 4-PC INDIANA GLASS/CLEAR GLASS "CUBE" 3 1/2" PUDDING-DESSERT GLASSES/FREE SHIP! 2-PIECE INDIANA KINGS CROWN "AMBER" COFFEE CUPS/FITS SNACK PLATES/FREE SHIP! 2-PIECE INDIANA GLASS GREEN "CUBE" 6" WATER-TEA TUMBLERS/FLARED TOP/FREE SHIP! INDIANA GLASS KINGS CROWN "AMBER" 10 1/2" SANDWICH TRAY/VINTAGE/AS IS/FREE SHIP! 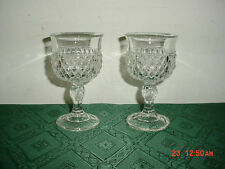 2-PIECE INDIANA GLASS "DIAMOND POINT" 6 1/2" PEDESTAL GOBLETS/VINTAGE/FREE SHIP! INDIANA GLASS "KINGS CROWN" DEEP AMBER ROUND 10 1/2" SANDWICH TRAY/FREE SHIP!